Tony Blair will step down as prime minister within a year, some of his closest allies are saying. 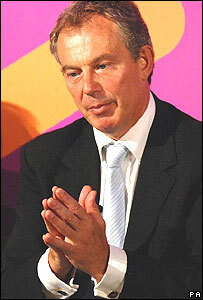 The latest is senior minister Hilary Armstrong, who said Mr Blair would be gone by the 2007 Labour conference. Seventeen normally loyal Labour MPs have signed a letter urging the prime minister to quit to end uncertainty. The Sun newspaper has said Mr Blair will step down as Labour leader on 31 May next year, but Downing Street is resolutely refusing to comment. Work and Pensions Secretary John Hutton called for an end to the "obsession about dates and particularly forcing a date out of the prime minister". He said he had "no idea" where the Sun got its information from and was certain there was not going to be a nine month leadership election campaign. He told BBC Radio 4's Today programme he was sure "all of the serious candidates who want to lead the Labour party" will want to keep the party on the centre ground of British politics. But he denied that he would be standing for the top job. International Development Secretary Hilary Benn told the BBC it was time to forget about the speculation. "We should trust the prime minister in what he has said, that he will do the right thing by the party, that he will, in due course, announce a date," he said. But junior defence minister Tom Watson, as well as six government aides, are among the signatories of the letter faxed to Downing Street. Mr Watson is reported to have later withdrawn his name. BBC political editor Nick Robinson said the apparent timetable would not stop critics of the prime minister trying to speed his departure, with the move being interpreted as a sign of retreat and weakness. 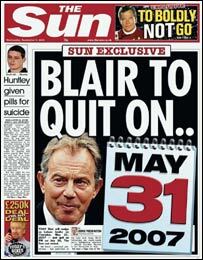 The Sun said that after stepping down as Labour leader, Mr Blair's time as prime minister would come to an end on 26 July 2007. And his comments were echoed hours later by former chief whip Ms Armstrong - the first member of Mr Blair's inner circle to go so far in statements about his future. "We expect that there will be a new leader in position for conference 2007," she told the BBC, echoing earlier comments by Cabinet colleague David Miliband. John McDonnell, chairman of the socialist Campaign Group of Labour MPs, confirmed that he would be launching his leadership campaign on Thursday. He told Today the last couple of weeks have "almost been like an episode of The Sopranos" and he did not believe that Mr Brown was the overwhelming favourite to succeed Mr Blair. How about teaming up with the Stones and playing duets with Keith Richards on their next tour? Mr Blair's Sedgefield constituency agent John Burton told Today he had "no indication whatsoever" about the prime minister's departure date "and normally I'm sure Tony would get in touch with me". But he said if Mr Blair's close friends Mr Miliband and Ms Armstrong were discussing this on TV "it must have some credence". Former minister Nick Raynsford said it was wrong that the issue had been "handed over to the media". Analysis: How will Blair go? "This is not the way in which government ought to operate, there should be a dignified statement from the prime minister himself." Downing Street said the letter from the 17 MPs, all of whom entered Parliament in 2001, had been faxed to its offices. "Although there has been much discussion of the content of the letter, it is marked 'private and confidential' and we intend to treat it as such," a spokesman said. A second group of Labour MPs elected in 2005 are thought to be drafting their own letter urging Mr Blair to quit immediately. Meanwhile, 49 Labour MPs have signed a statement saying they are satisfied with a 12-month timetable for his departure. Sir Jeremy Beecham, chairman of Labour's national executive committee, said the MPs' letters were misconceived.